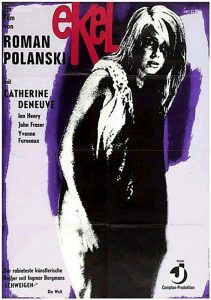 Repulsion is a 1965 British psychological horror film directed by Roman Polanski, and starring Catherine Deneuve, Ian Hendry, John Fraser and Yvonne Furneaux. The screenplay is based on a scenario by Gérard Brach and Polanski, involving a young withdrawn woman who finds sexual advances repulsive and who, after she is left alone by her vacationing sister, becomes even more isolated and detached from reality. Shot in London, it is Polanski’s first English-language film and second feature-length production, following Knife in the Water (1962).